The Professional Regulation Commission (PRC) Regional offices have released room assignment for September 2016 licensure exam for teachers (LET) or teachers board exam. On this page, check out full list of school assignment for Legazpi, Masbate and Pagadian. The room assignments as posted online on Monday, September 19, covered assignment for elementary and secondary education LET takers. Masbate City was designated as additional testing center for the second LET exam this year per Resolution No. 19, Series of 2016. 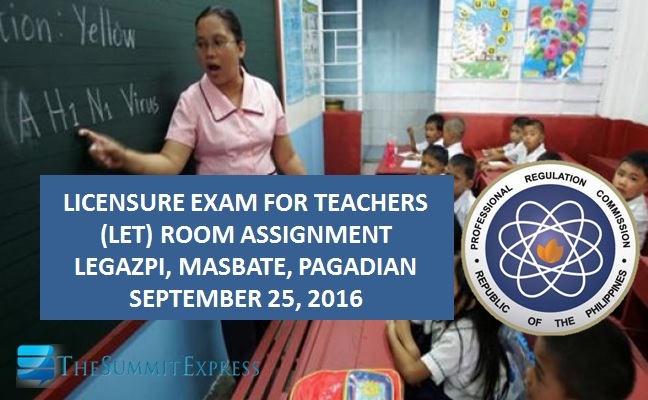 Aside from Masbate, Legazpi and Pagadian, Licensure Exam for Professional Teachers will also be held simultaneously in the cities of Manila, Zamboanga, Bacolod, Batanes, Pangasinan, Antique, Laoag, and all PRC Regional Offices on September 25, 2016. Check out the list of room assignment below. The Summit Express will also update this site for the results of September 2016 LET. Like us on Facebook, follow us on Twitter or subscribe via e-mail to receive exam-related news.